A home facial is a great way to maintain beautiful skin, and a good way to relax at home once a week. But a home facial doesn’t really a substitute for a professional facial by a licensed esthetician with special training in skin care. Why? A professional facial includes extractions which you shouldn't do yourself at home. When done improperly, extractions can scar your skin or cause broken capillaries or hyperpigmentation -- something you definitely don't want! The home facial works best when done in conjunction with regular facials by an esthetician you trust. Using the products she has recommended as right for your skin type, you can usually lengthen the time between your facial at the spa. Here are the steps for a DIY facial. Pull your hair back with a clip or headband so you have access to the whole face, neck and décolleté. Cleanse your skin with an on a round cotton pad. Stabilize the delicate skin around the eye by pressing your middle finger on the skin outside the eye along the eye socket. Gently wipe your eyelid with the cotton, starting near your nose and making little downward movements until you reach the other side of the eyelid. Repeat if necessary to get all mascara and eyeshadow off. Then fold the cotton round in half and wipe it gently underneath the eye. Repeat on the other eye with a fresh cotton pad. Then cleanse your lips with another small cotton pad with cleanser. Bend over the sink, splash your face with water and apply a small amount of cleanser to your fingers. Gently massage it into your skin without pulling or dragging at the skin. Make sure you take time to cleanse the areas near the hairline, the indentation where the nose and eye meet, next to your ear, and your decollete. Once you've covered the face with a cleanser and gently massaged it in, remove it with a clean white washcloth, again, stabilizing the skin. Make sure that the washcloth is free of all make-up. Then you know your skin is really clean. Have an esthetician help you find a gentle exfoliant. Avoid the apricot scrubs and other harsh, chemical-laden scrubs with a very scratchy texture. Don't overdo exfoliation during your home facial. A dry stretched feeling and redness are signs that you are over-exfoliating. Again, you need to protect your skin's acid mantle. 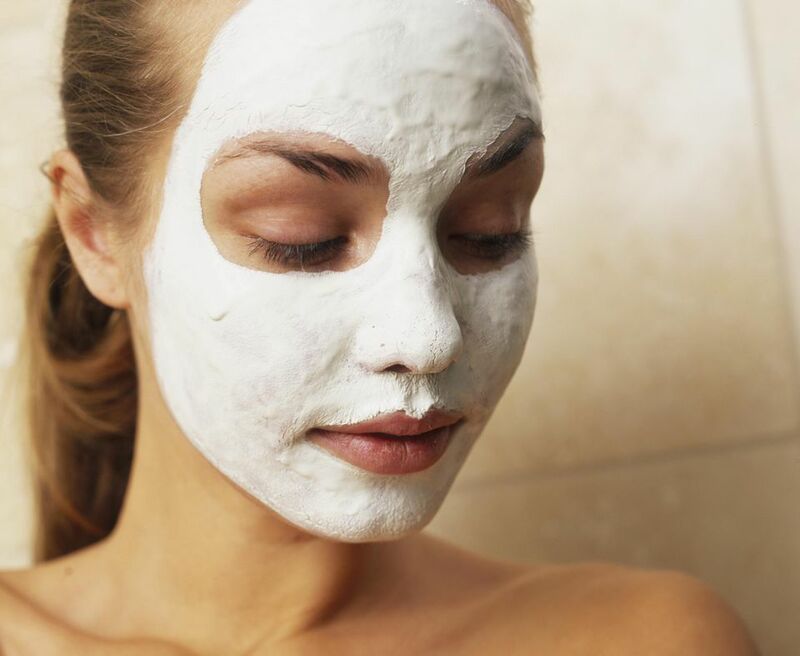 This is the treatment part of the home facial. There are lots of different kinds of masks for different skin types and conditions. Have your esthetician help you choose the best mask for you. It can change depending on the time of year, what climate you're in, your age, and where you are in your monthly cycle. Apply to your face and decollete and it back and read, relax, or watch TV. It usually stays on for 15 or 20 minutes. There are lots of different kinds of masks, so follow instructions for how long it stays on and removal. Splash your face with water and make sure all traces of the mask are removed. You can go over your skin with clean cotton pads or a clean, damp washcloth again to make sure it's all off. Spritz your face with a toner (it helps to hydrate the skin), apply the serum that's right for your skin, and end with a day moisturizer or night serum. Again, it's good to follow your esthetician's product recommendations. When you try to pick out inexpensive products for yourself it's easy to make a mistake. Enjoy your beautiful skin. You should see a difference after your home facial if the products are good. Find an Esthetician You Can Trust. Why is this important? A professional esthetician can advise you on your skin type and condition, and give recommendations on how to take care of your skin at home. If you have a good feeling about her knowledge and skills, invest in the products she recommends. Spa skin care lines offer higher quality than products you find in a drug store, which use cheap ingredients, or department stores, which have artificial fragrances, expensive packaging, and big advertising budgets. On your own, you might pick out products that can actually harm your skin, like apricot scrubs and aggressive foaming cleansers. Also, an esthetician can also give you advice on home care, and show you how to avoid common problems like overly vigorous rubbing and over-exfoliation during your home facial.